When Guerline is five, she moves to live with a woman in another village, far from home. Her mum says it’s better there. She is the youngest of six siblings and her mum and dad can’t always afford to give her food. At her new home Guerline is given food, but she has to work for it. She fetches water and wood and helps with the cooking. Guerline sleeps on a blanket on the floor. She can play if there’s time between all the household chores. She must fetch water, cook, do the washing up, do the washing and hang it out, but also clean, lay the table and make the beds every day. When Guerline is seven, her mum comes to fetch her. 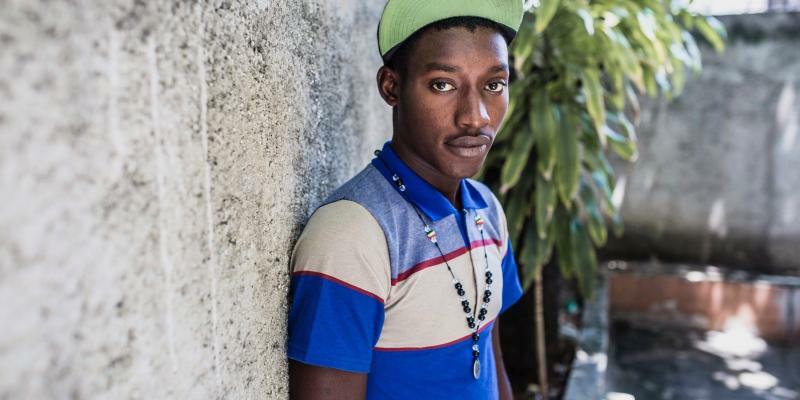 “You’re going to move to live with a woman in the capital, Port-au-Prince,” says her mum. It’s even further away from home. “I’ve come to an agreement with a woman there that you can live with her and maybe go to school. But you’ll have to help around the house, just like you do here,” says her mum. The next day, the woman arrives. Her name is Magalie. She takes Guerline with her to the capital. When they arrive, Magalie shows Guerline the house where she’s going to live and work. There’s another woman living in the house with her children. They are older than Guerline and go to school. “There’s room for you to sleep here,” says Magalie, and points to the floor by the kitchen table. 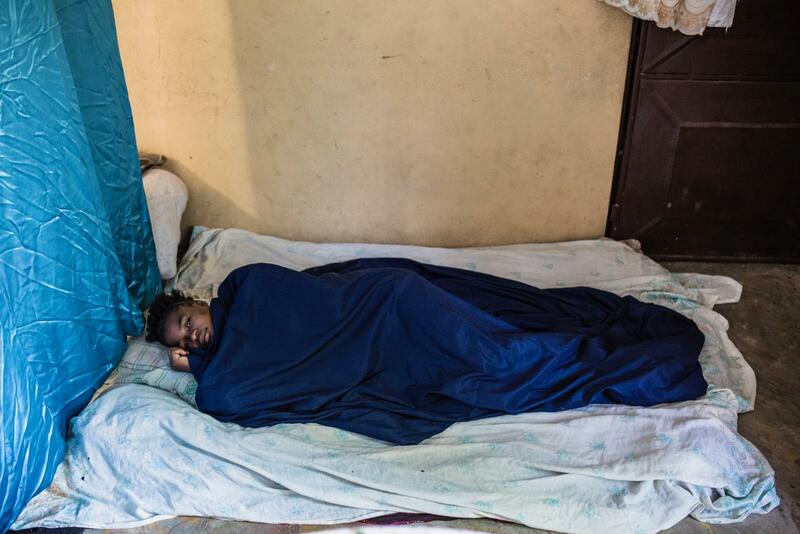 The other children and the adults sleep in beds, but Guerline just gets a few blankets to lie on. Guerline gets up early. She cooks food for everyone, cleans, does the laundry, goes shopping and washes up. During the day she is often alone. The others are at school or working. Guerline doesn’t think it’s that odd that she isn’t going to school. None of her siblings do. But she likes watching the children in the house putting their school uniforms on. They have rucksacks, they do homework and talk about their day at school. When Guerline is out shopping, she often passes a school where the children in their smart uniforms are playing in the yard. Sometimes she meets children on their way to and from school. Guerline doesn’t have any friends. The other children in the house and on the street usually play once they’ve done their homework. Guerline rarely has time to join in, there’s so much to do around the house. When she is ten years old, Guerline decides that she wants to go to school too. She wants a school uniform, friends and to learn things, like all the other children. “When can I start school?” she asks Magalie. “There’s no time. And we don’t have the money for it. And you’re already ten years old. You should have started when you were six,” answers Magalie. There’s another problem. Guerline has no birth certificate to prove when and where she was born, and who her parents are. No one can start school in Haiti without this document. Guerline has to sleep on the kitchen floor. One day, there’s a knock at Magalie’s door. Outside there’s a man who says he’s from an organization called Zanmi Timoun. “Why isn’t Guerline going to school? It’s her right. And our school is right by your house,” says the man. 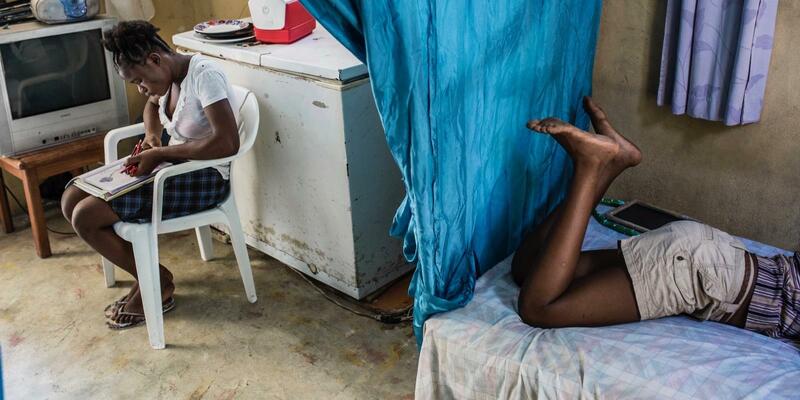 “We don’t have the money or a birth certificate,” replies Magalie. 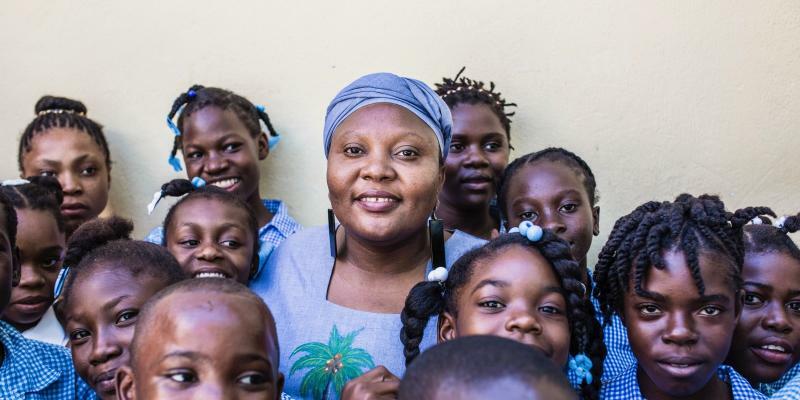 Magalie gets to find out about children’s rights and about Haiti’s law, which says that all children have to go to school. Magalie has been promised that Guerline will be at home with her to help out. She doesn’t want Guerline to go to school several hours a day. “It makes no difference. She has to go to school. 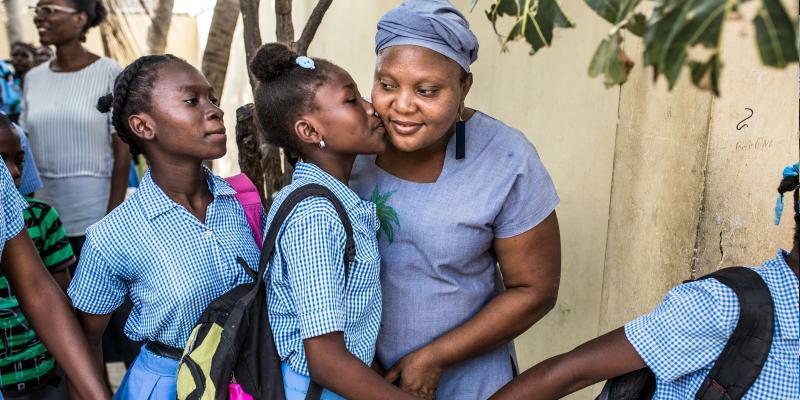 She can come to us for four hours a day and then you must give her some time to do her homework, and then she can carry on helping you at home,” says the social worker from Zanmi Timoun. Guerline can’t believe what she’s hearing is true. She gets a school uniform, a pair of shoes and a rucksack. The man accompanies her to school. She writes her name in the headteacher’s book. Magalie has to come and sign it. The first day at school is hard. Guerline is shy. But it’s the happiest day of her life. A dream has come true. But Guerline still sleeps on the floor and every day she has to get up early to cook food, clean, do the laundry, wash up and buy food. Guerline starts longing for home and her own family. She misses her mum and dad and her brothers and sisters. Why can’t she live with them and go to school there? 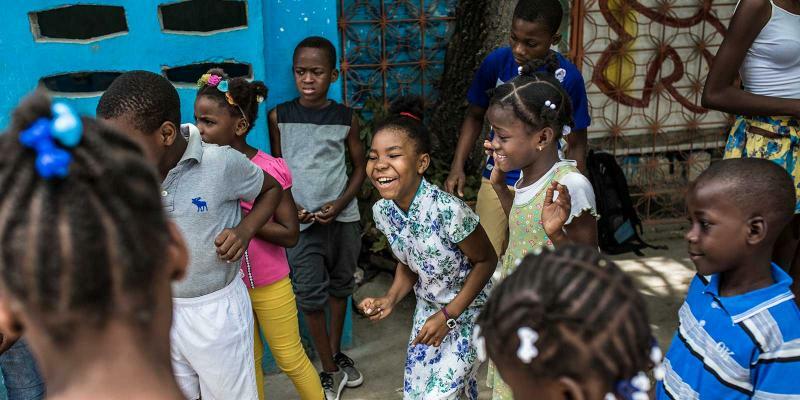 When she’s been at school for two years, Zanmi Timoun helps her travel home to visit. Guerline is now 12 and hasn’t been home for seven years. Her mum, dad and siblings are happy to see her. Guerline tells them proudly that she’s started school. She plays with her brothers and sisters, but there’s a lot of work to do out in the fields. When the local farmers need help, the family works in their fields to earn money to put food on the table. “You have to help out,” says her mum. Soon Guerline is no longer the family’s school girl home to visit. She’s just another person who can contribute to the family’s finances. 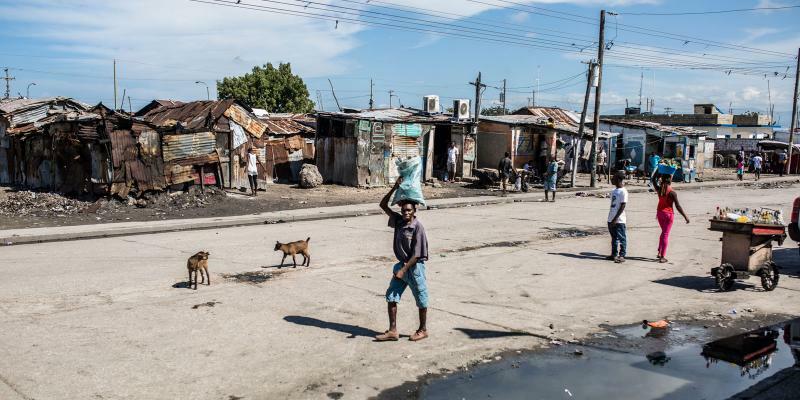 When she returns to Port-au-Prince after the summer holiday, she vows never to go home again. Guerline misses her family every day, but she doesn’t miss being forced to work by her mum and dad as well. She sees school as her future. 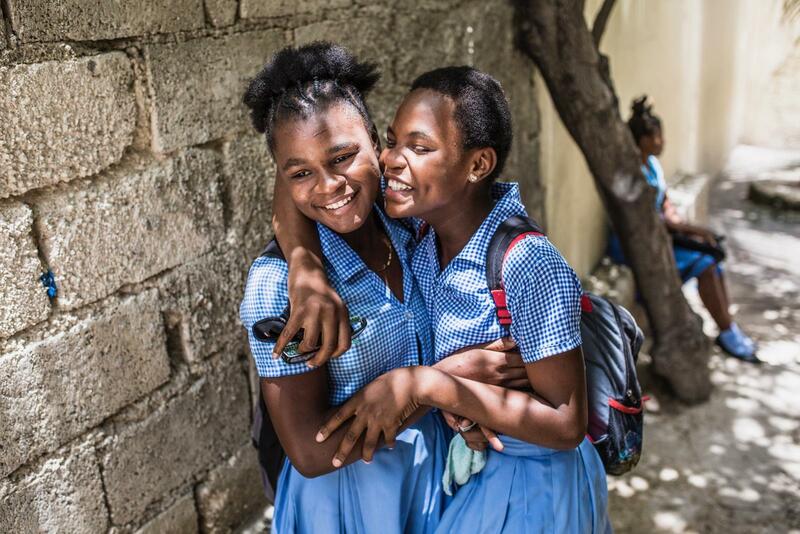 When Guerline is in school, she is spared from working and can spend time with her friends. On the first day of term, Guerline tells her school friend Nathalie how horrible it was at her parents’. She cries. Nathalie cries too and they give each other a hug. Every day, Guerline longs for school to start. Then she won’t have to work and she gets to meet her friends. There aren’t many who live as close to school as Guerline. Lots of children have a long bus journey to school. They often arrive late as they also have to work where they live. There’s rarely time for homework when the children are forced to work as domestic slaves where they live. The teachers at the school know about this. Instead of punishing students who haven’t done their homework or who arrive late, they talk to the students to make sure they’re ok. Sometimes the children say they’re being beaten by the family they live with. Or that the family shouts and swears at them. They come to school with bruises. Guerline has to manage the entire household by herself. She feels she is worthless, and she cries when no one is looking. 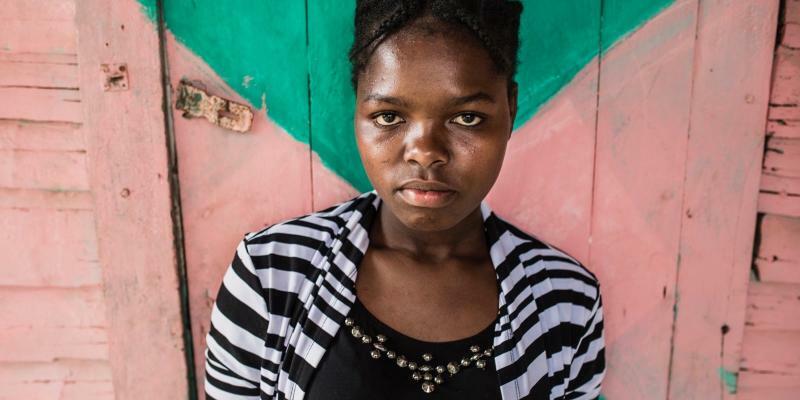 Guerline’s dream is to finish school and start her own business. 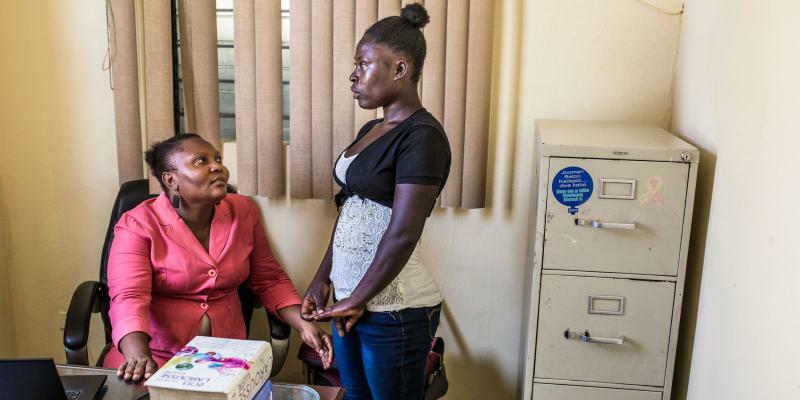 Zanmi Timoun can provide financial support and help with loans when she reaches 18. She’s going to save up the money she earns so she can study to become a nurse. “I think about it when I’m scrubbing the floor,” says Guerline. Wants to be: A nurse. In her free time she likes: Drawing. Doesn’t like: People swearing at me.